Hello, it’s Andy Gesner and the tireless staff from HIP Video Promo. Three young men — the members of Montreal-based Plants And Animals — are ushered into a swank, secretive restaurant/theater. There are no windows, the tables are covered with fine white linen, and oranges are stacked in pyramids at the center of each seating area. The clientele is tony: they wear tiaras, white gloves, cravats, fancy hats, and in some cases, indoor sunglasses. The musicians aren’t exactly out of place in this setting, but they’re not completely comfortable, either, and they scan the room warily. And just before the music starts, the flamboyant master of ceremonies appears at the top of a guardrail, promising amazement and wonder, and not a inconsiderable amount of danger, too. So begins the beautifully-shot video for “The Mama Papa”, the lead single from the upcoming La La Land. The cane-wielding emcee could easily be speaking about the band themselves: Plants And Animals have established themselves as one of the most reliable sonic thrill-rides on either side of the border. “Plants And Animals offers up explosive, Polyphonic Spree-sized choir choruses,” raved Rebecca Raber in an ecstatic Pitchfork review, “1970s AM radio guitars, cozy folk balladry, and rambling stoner boogie-often in the course of one song– and switch between them with little warning.” Parc Avenue, their 2008 full-length, was likened to Arcade Fire, Devendra Banhart, and Flaming Lips, and was shortlisted for the Polaris Music Prize for best Canadian album of the year. 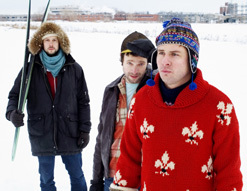 The set won plaudits for its musical sophistication and expansive songwriting, and the trippy clip for “Feedback In The Field” suggested that Plants And Animals had a cinematic vision to match their sonic ambition. Now comes La La Land — an album that fulfills the promise of Parc Avenue and adds some clever new devices to Plants And Animals’s already-stuffed toolbox. This trio isn’t afraid to call themselves a “post-classic rock” band, and, indeed, “The Mama Papa” boasts an impressively epic sound. Guitars sting, bass throbs, percussion bubbles up from the track, and Warren Spicer’s voice locates that perfect middle ground between deep-woods gruff and sugar-sweet. It’s a song that feels upon first listen as if it’s always existed; it’s instantly-memorable, and infinitely-replayable. It’s the rare video that merits a genuine comparison to French art film of the Sixties and Seventies — but Plants And Animals is a rare band, and they’ve turned the trick here. The clip for “The Mama Papa” is detailed, carefully-arranged and thought-provoking; it’s also crisply-directed, intelligently-blocked, and gorgeous to look at. Every shot is meticulously composed; every performance is fully embodied. And when the prestidigitator-emcee enters the minds of the members of Plants And Animals, we’re plunged into a wholly believable childhood reverie. The doors swing open on the distant past, and we’re shown a little boy fleeing from his mother and dodging a scrubbing at the hands of his maidservants. Yet there’s something ominous about the scene that remains unspoken: and when the walls of memory crumble at the end of the clip, everybody (including the emcee) is left dizzied, wondering exactly what has happened and why. We’re very excited to be working with the team at Secret City Records to bring you this eclectic new clip. If you need more info, call Andy Gesner at 732-613-1779 or e-mail us at info@HIPVideoPromo.com . You can also visit www.SecretCityRecords.comor www.PlantsAndAnimals.ca to find out more about Plants And Animals.